Named for the Second World War battle of Tarawa, the aircraft carrier USS Tarawa was built at Norfolk, Virginia. After being commissioned in December of 1945, she joined the Pacific Fleet in July of the next year. For the next year, she served in the Pacific, then went back to secure the US west coast. She returned to the east coast after a world cruise beginning in late 1948. The ship was taken out of commission in June of 1949. She was recalled in February 1951. During the Korean War, she had duty in the Atlantic and Mediterranean. In October 1952, her designation was changed to CVA-40. For a year, starting in September 1953, the ship cruised east through the Mediterranean and into the Far East waters. 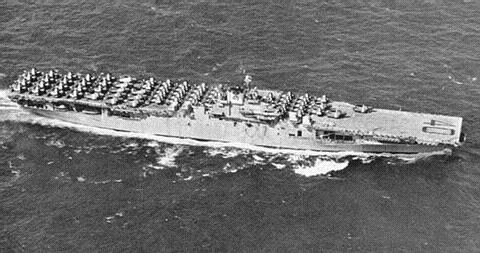 Tarawa returned to the east coast in late 1954 where she was converted for anti-submarine aircraft support. This changed her designation to CVS-40 when she came back into service in January 1955. For the next five years, the ship cruised the east coast and Caribbean conducting anti-submarine and helicopter exercises. In May 1960, the ship was decommissioned the second time and sent to the Atlantic Reserve Fleet. In 1967, the ship was removed from service completely.